I'm racing ahead with preparations for this Thursday's Kids Adore Ditch. I've already had one small problem to overcome. When I looked closely at my 3pi on Friday I realised that the mounting bracket of one of the motors is broken. I've ordered a replacement but it will not arrive until Wednesday at the earliest. I had two 3Pi demos in mind, and I'm a bit wary of reprograming on the day, so I decided it was time to get a second robot. HobbyTronics offered the best price, and for an additional charge I asked for delivery on Saturday Morning. The new robot arrived on time and I started to prepare the demo. It's been a while since I did anything with these robots, so I needed to remind myself about how to program them. I love the documentation on the Pololu web site: it's simple, clear and correct, and covers Windows, Linux and OS/X users. I have the GNU gc++ avr cross compiler and avrdude installed on my workstation already, so it took me less than five minutes to compile and load a simple LED blinker on the 3Pi. Another minute and I'd installed the Line follower. I used the approach suggested on the website and laid out a simple track using A2 paper and black electrical tape. The robot did a good job of following the line, but the demo soon palls and I wondered if the Maze solver program might have more lasting appeal. I quickly laid out a simple maze design and installed the maze example from the Pololu library. As luck had it, my maze was close to perfect; the robot explored every path before it found the goal. Once it's mapped the maze, it shows the shorthand for the solution on its LCD display and then navigates as directly as possible from start to finish. If I have time I'll make some more mazes, and maybe do a larger one A1 size. First, though, I have other demos to prepare. I had to install a fresh rasbpian image on C3Pi, so I need to set up the wifi and install the relevant Python software on the on-board Raspberry Pi. At least the Arduino pro mini doesn't need reprogramming. 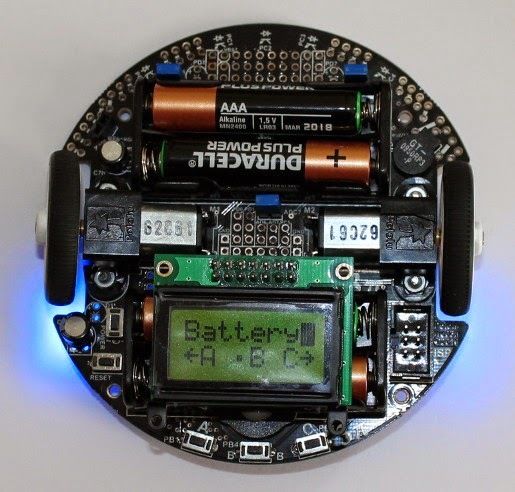 I must also remember to install a fresh set of batteries in C3Pi, which is not a trivial task! Once that's done I will need to mend the second 3Pi and prepare it. I have come up with a very different demo, but I will have to code it from scratch, We'll see if I can get it done in time! 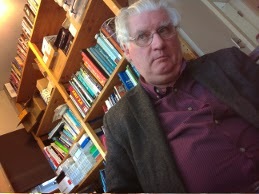 At last C3Pi can see, thanks to the wonderful Raspberry Pi camera module. His first attempt at photography isn't going to win any prizes for composition, but no doubt he will get better with practice. I need to add a robust holder for the camera, but it should mean that we can take some photos at the Kids Adore Ditch event on Thursday. If we're really lucky we may even have streaming video. C3pi, a veteran robot of my own design, will be joining the Pololu 3pi and me at Kids Adore Ditch this coming Thursday. 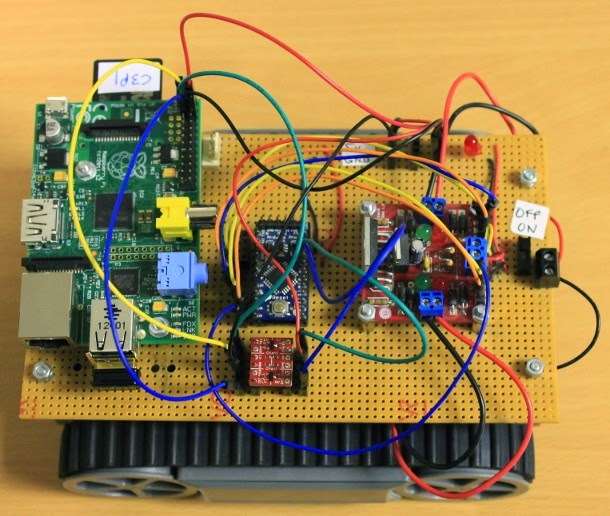 Trackbot started out as an Arduino-controlled robot. I added a Raspberry Pi, and he became C3Pi. An additional WiFi dongle on the Pi allows me to control him remotely. C3Pi has made several public appearances over the years, and I hope he'll perform well on Thursday. He has one weakness; his batteries are buried in his tummy, so when they run out he needs major surgery. One day I'll come up with a better solution, but probably not this week! I've just had a nice surprise. Last November I ordered and received a PCB from ragworm, and I've only just got around to assembling and testing it. The area around the capacitor looks a bit messy because I soldered in a 100pF capacitor instead of a 100nF capacitor and had to remove it - it's not a manufacturing problem. The project is a breadboard-friendly Arduino clone inspired by the low-cost, minimalist shrimp. I need a bunch of them - that's why I needed to install burn boot-loaders - and I have a batch of three boards with a corrected design on its way here from OSH PARK in the US. I will need even more of the boards, though, and this morning I spotted an old email from ragworm which has solved my problem. I originally ordered a single board from ragworm, but they made four, just in case! The three spares have been waiting patiently on the shelf, and the email (sent last December) offered them to me at a very attractive price. Today I asked if the offer was still open, and got confirmation within minutes of my email. I've snapped up the offer, and three more boards are on their way to me. In yesterday's post about the phenoptix AVR ISP I said I'd share the details of how I used it to install a boot-loader on a blank chip. I was preparing the chip for use in an Arduino clone of my own design. Watch this space for details of that project! For now I'll talk you though on the boot-loader instalation. 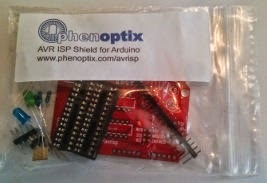 Carefully insert the chip you want to prepare into the appropriate socked of the phenoptix AVR ISP shield. You may need to straighten the legs of the IC chip before you can insert it. Carefully plug the pins of the shield into the header sockets of the Arduino. You'll need to upload a special sketch to the Arduino. Don't use the standard ISP sketch from the Arduino examples menu. You must use a sketch that's specific to the phenoptix shield. You can get that sketch from github. click on the button marked Raw. Copy the text of the sketch to the clipboard. Save the sketch. I called mine phenopitxISP. Up to this point you've used the Arduino IDE in the usual way; you shouldn't need to change the port or board settings from those that you normally use. For the next stage, however, the Arduino IDE needs to know about the chip you want to prepare, not about the Arduino that you're using as an ISP. If you're preparing an ATMega328p, as recommended, you will need to change the board setting on the IDE to Arduino Duemilanove w/ ATmega328. 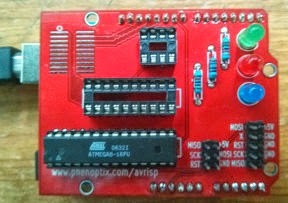 (For an ATMega8, which I also wanted to use, you'd select Arduino NG or earlier w/ ATMega8). In the IDE, from Tools/Board, select the board type that corresponds to the target chip. From Tools click on Burn Bootloader. You should see a Burning Bootloader message appear on the status line at the bottom of the IDE. The lights on the shield will flash for quite some while - a minute or so. Once they stop you should see a message on the IDE status line indicating that the Bootloader has been installed. Now you're nearly done, with one more phase left. For this stage you will need to try the chip out in the clone where you plan to use it. Carefully remove the chip from the panoptix shield. Insert it into your clone board. 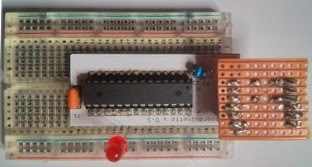 Connect the clone board to the computer running the Arduino IDE. You may need to change the port setting on the IDE if you are using a different USB cable from the one you used with your Arduino. Using the IDE, install a test sketch on your clone. I edit the standard blink sketch to use delays set to 100 ms. The LED blinks rapidly and I can easily see that I've installed something other than the default version of the sketch on the chip. 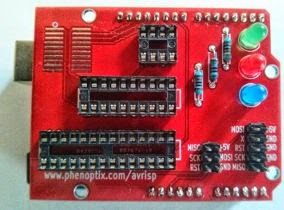 The phenoptix board and software have proved easy to use, and I'm very pleased with the result. I'm now well on the way to preparing the set of Arduino clones I needed. There seems to be a dearth of Atmel AVR™ ATMega328 chips in the UK at the moment. with Farnell and RS Components both awaiting deliveries. I needed ten urgently, and found them at Rapid Electronics. These are unprogrammed chips without a bootloader. If you want to use them in Arduino™ clones you will need to burn in a bootloader yourself. I've been doing just that, using phenoptix' AVRISP board with an Adruino UNO. I'll blog about that tomorrow.